As Canada dives headfirst into the legalization of cannabis, there has been rising interest in its potential medicinal benefits, including its therapeutic use for people with Alzheimer’s disease. Over the past decade, researchers and clinicians have investigated the effects of cannabinoids, the chemical compounds in the cannabis plant that give it its medicinal and recreational properties. One of the things they have studied is whether cannabinoids can reduce agitation. We know that agitation is a common change in behaviour in people with Alzheimer’s disease. And while everyone agrees that agitation should first be treated through non-drug approaches, medications may be needed for severe agitation that doesn’t respond to other approaches. There are existing medications that can treat this type of behaviour, but many of them have harmful side effects. In fact, the medications that tend to be the most effective can sometimes lead to stroke, or even death. Cannabinoids, on the other hand, interact with the body differently, which means they could be safer and more effective overall for someone experiencing agitation. Some of their effects are even thought to help reduce brain cell death. So far, though, there have been a limited number of studies that look at cannabinoids as a treatment specifically for people with Alzheimer’s disease. Further study is important because cannabinoids may not have the same effect on a brain with Alzheimer’s disease as they do on a healthy brain. For example, while cannabinoids can have calming effects when used in the general population, they may have the opposite effect in people with Alzheimer’s disease. Thanks to funding support from the Alzheimer’s Drug Discovery Foundation and the Alzheimer Society Research Program, my team at Sunnybrook Research Institute launched a pilot study to investigate further. We enrolled a number of adults with moderate to severe Alzheimer’s disease in a 14-week trial and gave each person a synthetic cannabinoid, called nabilone, to treat agitation and/or aggression. Nabilone is currently approved in Canada to treat chemotherapy-induced nausea. By comparing the effects of nabilone with a placebo, we set out to determine whether nabilone can reduce agitation without causing the major side effects common to other medications. Pain and weight loss are also significant problems for people with advanced Alzheimer’s and are often associated with agitation and aggression. Since cannabinoids have been associated with improvements in pain and appetite, we also measured changes in those symptoms in trial participants. What did we learn? Nabilone not only significantly reduced agitation compared to the placebo, but it also improved behavioural symptoms overall. The most common side effect we found was increased sedation. Our next step is to conduct another trial with more individuals to confirm our findings, with particular emphasis on efficacy and safety. While we’re hopeful that our study will pave the way for additional research on the use of cannabinoids to treat symptoms of Alzheimer’s disease, we also caution physicians, people with dementia and families that we need to do more research before we can recommend cannabinoids to treat agitation. We need more studies to replicate our findings and investigate anticipated side effects associated with cannabinoids, such as sedation and worsening memory. More research will go a long way in clearing the air around the potential benefits and drawbacks of medical cannabis, and support informed guidelines, policies and standards. That way, we can focus less on short-term attempts to counter behaviour and more on the mental well-being of people living with dementia. 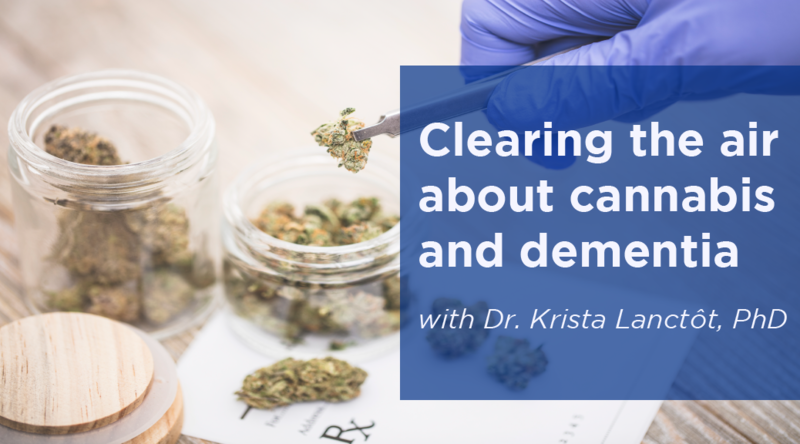 Dr. Krista Lanctôt, PhD, is a senior scientist with the Hurvitz Brain Sciences Research Program at Sunnybrook Health Sciences Centre, and a professor in the Department of Psychiatry and the Department of Pharmacology and Toxicology at the University of Toronto. She received a biomedical grant from the Alzheimer Society Research Program to run a pilot study on the effects of cannabinoids to treat behavioural changes in people with Alzheimer’s disease. Dr. Lanctôt recently presented the findings from this study at the 2018 Alzheimer’s Association International Conference, July 22-26 in Chicago, IL. Read more about Dr. Lanctôt’s story.